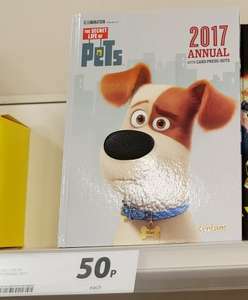 The Secret Life of Pets Annual 2017 Reduced to Only 50p! £1 at Amazon, Argos and Smyths! Found this morning at Tesco Extra, Park Rd, Liverpool. There were about 6 on the shelf. Great price for a nice little annual which includes animal facemasks for the kids. Should be national as it is a standard SEL. All the annuals were 50p in Sheffield extra but sold out now. Still loads in Ipswich too also peppy pig and scooby do. Been that price since before xmas. This is a good deal. thanks. It was but then it wasn't, and all annuals has been posted many times and deleted. Anyone seen them in the Castle Lane store?